Are you out of Balance, in Pain, Stressed or Ill? Spasms, Back Ache, Headache, Migraines, Arthritis, Heart Problems, Hormonal Problems, Autoimmune Disorders, Scoliosis, Swollen Ankles, etc.? Then take heart, for you CAN become healthy again, in body, spirit and mind! If you can find the cause, because there is ALWAYS a reason WHY, you can fix it! The first step is that you must want to get better, and must be willing to love yourself to do the needed things. Pain and discomfort is NOT normal, it’s your body’s way of telling you that there is something wrong. And if you leave it for too long, the cause becomes worse and will take longer to fix, and more effort! If you’re into helping yourself, knowledge is the first step, and if you want to do things without chemical and surgical intervention, this is the natural health way. We do not only have a physical body, but mental, emotional and spiritual bodies as well. The alignment of all of these is very important in a wholistic way as they are all interlinked. Everything works together. Firstly, posture plays a vital role in our physical alignment, but our thinking and emotional states also influence our physical body and reflect there – this is called the Body-Mind. Eastern healers have been utilising it for long time, and Westerners are now also seeing the light and have developed Psycho-Neuro Immunology (PNI). Quantum Physics can explain how this all works…The “What the Bleep” documentary movie is a good starting point! Your pelvis is the base that your spine rests on. If it is skew, it affects the whole alignment of the spinal column. The spine has natural curves in it to provide flexibility, but anything more places pressure on the cushions between the vertebrae and this then pinch the nerves that come out of the spine. 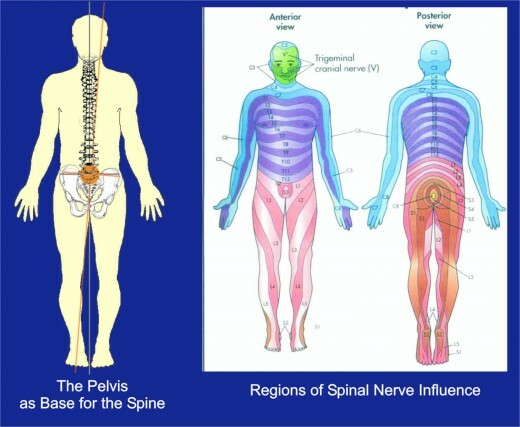 Every nerve that comes out of the spine feeds an organ or a part of your body, a limb or an area. If its function gets impaired, the area it goes to doesn’t get fed. This means that area, organ, limb and any joints along the way will lose their function over a period of time and the body will start to do things to protect them. This will include padding with anything there is an excess of in your body, water, toxins, acid or calcium. The muscles will also go into spasm around the nerve to protect it from any further damage and will form sheaths and knots. Your posture is therefore absolutely vital to the health of your spine, the nerves that come out of it and the whole rest of your body that they feed! Go to any chiropractor or practitioner that can adjust the pelvis NB!!! 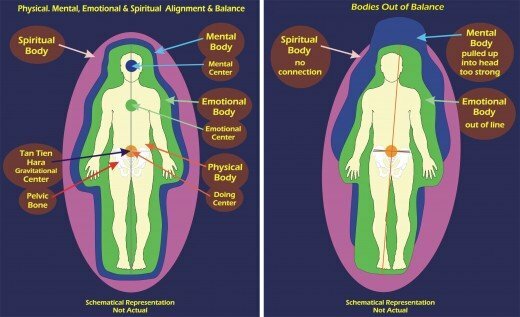 Besides your Physical Body, you also have a Mental Body, an Emotional Body and a Spiritual Body (in simplified terms). Think of these all centred in the gravitational middle of your physical body (where your pelvis is!) and lying on top of one another. If your physical body is out of line, it will also throw out the alignment of these other, more subtle energy bodies. You might feel this as not quite being yourself, because now you are out of touch with your emotions and your Spirit. Some people might experience this as feelings of depression. Emotions will feel more intense and you might lose control over them. Your Mental Body protects your Physical Body, so any areas not covered by it anymore are susceptible to injuries when placed under pressure, e.g. the feet and ankles if you’re pulling all your attention up into your head and shoulders by using your brain or thinking too much, i.e. working in front of a computer all day or studying! So it is important to look after your physical alignment, but it is also just as important to realise that it works the other way around too! What you think or feel reflects in your physical body. Your posture influences your emotions and mental health! Every single thought and emotion links to a part of your body, depending on its nature. For instance, if you’re happy, you will tend to walk up straighter, facing the world head on and your chest and heart area will be open. If you’re sad or unhappy, your head will tend to droop forwards and your shoulders will slump, closing off and protecting your heart area. If, more specifically, you feel that something or someone is a pain in the neck, your anger will tend to tense up the muscles in your neck area and then that is exactly what you will have – a pain in the neck! So, long standing patterns of thought, or emotional trauma of any kind will cause certain areas to tense up, restricting the natural flow of life force, blood and nerve flow to the area, causing them to become stressed and even diseased. The body will start to protect the area in different ways too, providing padding, swelling, tight muscles or calcification to prevent any further damage, and this will restrict movement even more. A vicious cycle! Your mind can interfere in this way with the natural flow in your body, so becoming aware of negative thinking patterns and changing them is a must for your overall health. Making sure that you do not allow negative emotions to get out of hand is also vital. This does not mean that you must suppress them, you’re allowed to feel the way you do, but HOW you choose to react to them is up to you! And most importantly – Find the reason WHY you feel that way, it’s just an insecurity or a fear…and change it! In summary, you are fully responsible for everything that happens in your life and body, how you carry yourself, what you eat, do, think and say. All of these have an impact, positively or negatively. The CHOICE is YOURS! This is wonderful news, because it is empowering to know that you CAN make a difference in your own life and be healthy. There is a reason for any imbalance and knowing this, you can find it and fix it! Branch in Cape Town Now Permanent!